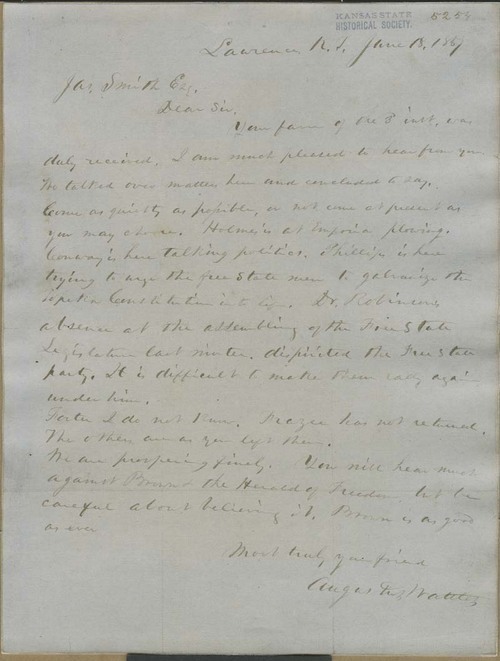 From Lawrence on June 18, 1857, Augustus Wattles wrote Jas. Smith (Is this a Brown alias?) regarding affairs in Kansas Territory, specifically referring to several of the Free State Party's leaders: "Holmes' is at Emporia plowing. Conway's here talking politics. Phillips is here trying to urge the free State men to galvanize the Topeka Constitution into life. . . ." and Robinson had "dispirited the Free State party" by his absence from the legislature last winter, making it "difficult to make them rally again under him." Although one hears "much against Brown" he is "as good as ever."